During our latest trip to Maui my husband and I wanted to take the kids on a little adventure. 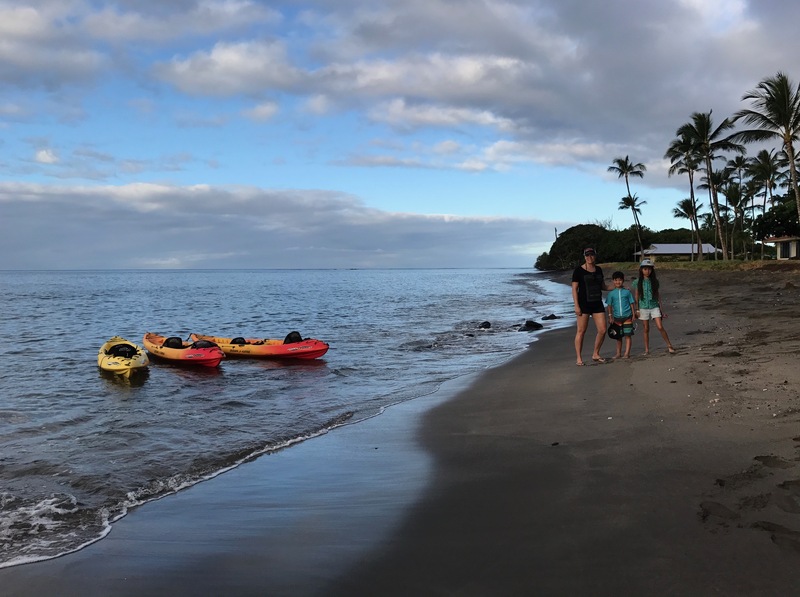 We always love spending most of our time at the beach when in Hawaii but this year, we wanted to take the kids out on a excursion. 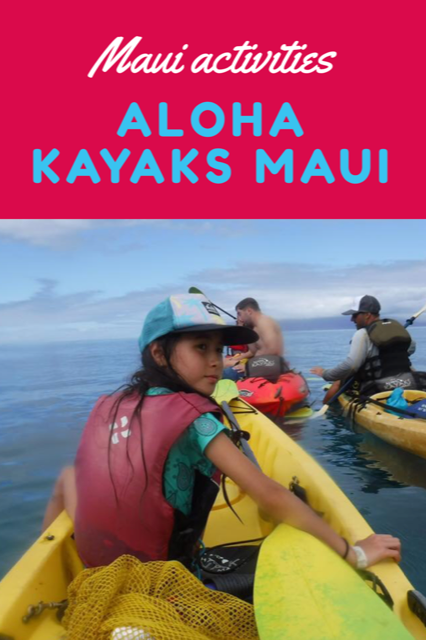 Our friends had mentioned that they really enjoyed their Kayak and Snorkel tour with Aloha Kayaks Maui so we decided to book this excursion. We booked the 7:15am tour out of Olowalu (only 25min away from where we were staying in Kaanapali). When I booked I thought a 7am tour was a crazy option but with the time change it made a lot of sense. Other benefits of an early tour include calm waters and cooler weather. 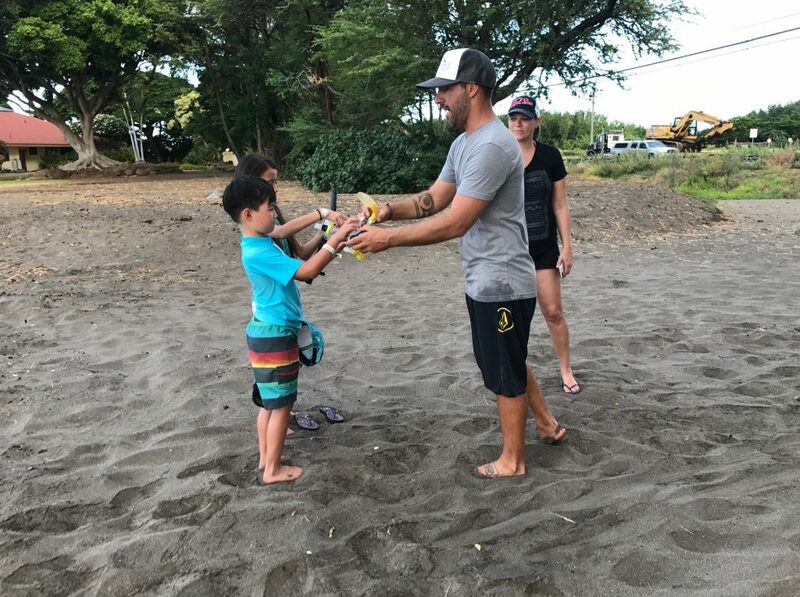 We arrived at Olowalu beach and met our guide Mikey. 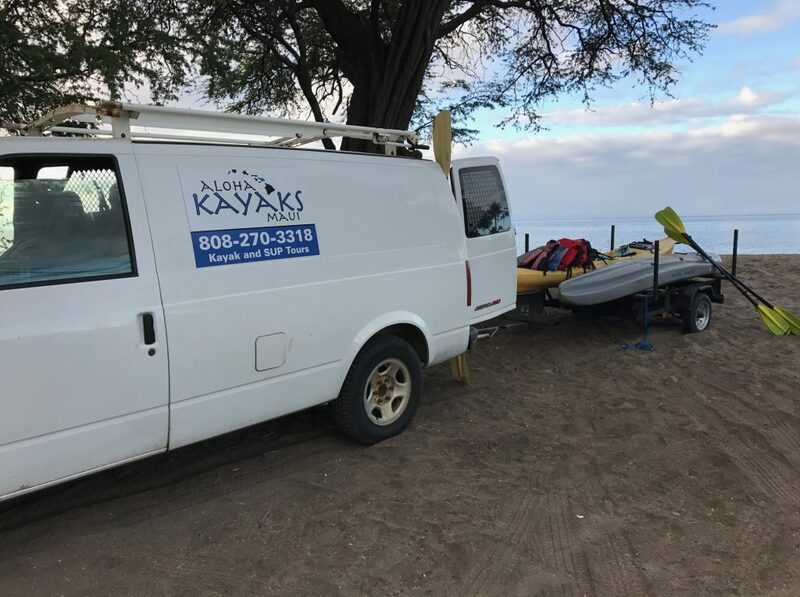 Aloha Kayaks Maui brings all the gear you need – Kayaks, life vests, snorkel gear and drinking water. Our group got a short information session on the beach then Mikey got us set up and into our kayaks. My husband and I each shared a kayak with one of our children. They sat in front and we did most of the paddling. 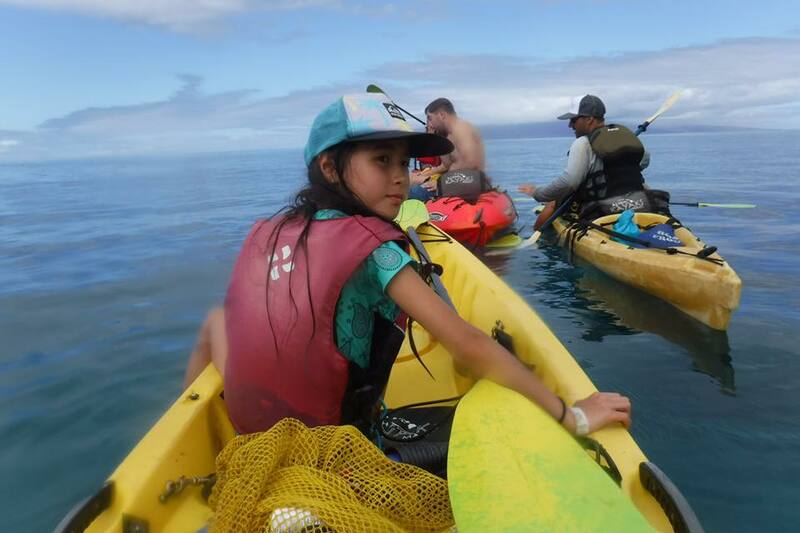 Mikey guided us out and shared so much information about Maui and ocean life while paddling. This kayak excursion was very mellow and slow paced (something I was so happy about, I wasn’t prepared for an intense workout!). After kayaking for about 30 minutes we changed direction and headed to one of Maui’s oldest reefs to snorkel. There was another group there when we arrived but there was so much to look at that it didn’t matter. Once we arrived at a good spot, Mikey ancored his kayak and attached our kayaks to his one by one. Then we put on our snorkeling gear and all jumped in. 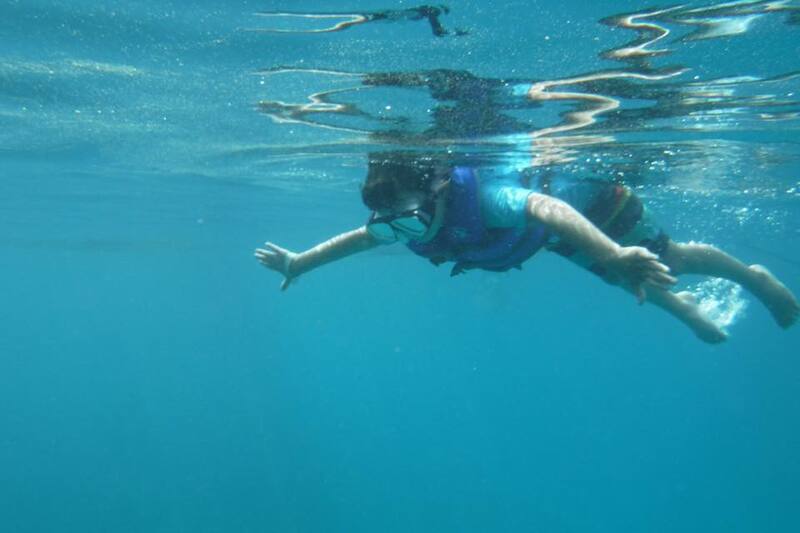 My children are good swimmers but had never snorkeled before. My six year old was a little nervous to be out in the middle of the ocean but Mikey made him feel very comfortable. Soon we were all in the water exploring. We saw many tropical fish and turtles. 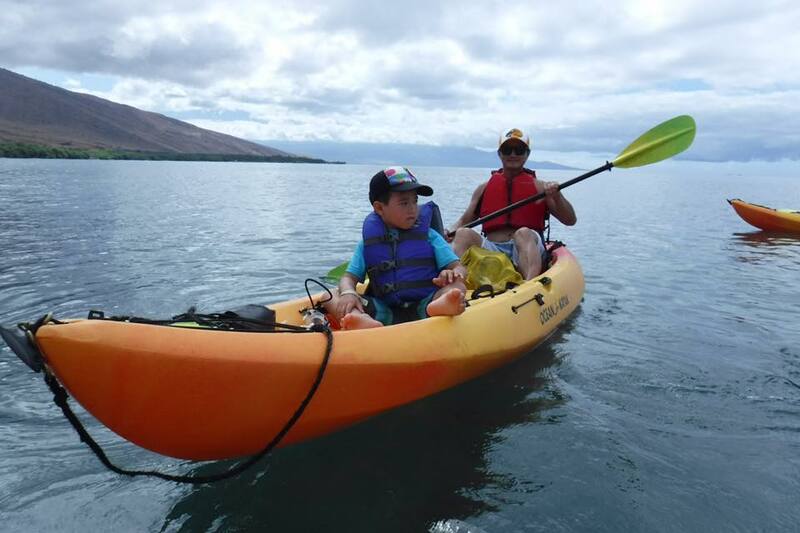 My family really enjoyed our Kayak and Snorkel tour with Aloha Kayaks Maui. I strongly believe this is a great family excursion to do when on Maui. Our professional guide was a wealth of information. The kayaking was low intensity and the snorkelling was great fun. I’d love to know, have you gone on a kayak tour with your family? What did you like about it? Disclosure: Aloha Kayaks Maui offered my family a complimentary tour in exchange for this post. All thoughts and opinions are my own and we truly enjoyed our kayak and snorkel tour. I would love to visit Maui one day, looks so beautiful! Sounds like a lot of fun, I would have loved going out first thing in the morning as well, so very peaceful and calming!! It looks so beautiful there! What a seriously amazing experience. I would love to go there someday!